OMEGA’s SSR3PH Series three-phase Solid State Relay is a fully integrated device with heat sink and DIN rail mounting plate in a space-saving design. Each unit is touch safe with LED input indication. This normally open, zero crossing device is capable of millions of cycles of operation. Dual SCR’s provide a high level of reliability, capable of handling higher overloads than triacs. 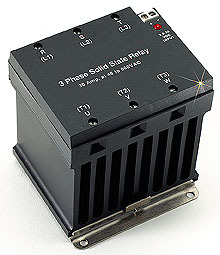 This 3-phase Solid State Relay is designed for switching power to 3-phased asynchronous motors and to resistive loads.